The Melplash Agricultural Society is very pleased to announce that all children aged 16 years and under will go FREE to this year’s Melplash Show taking place on Thursday 25 August 2016. The annual Show is a great day out for all the family and now with all children being able to attend for free it really is a day in the Bridport calendar not to be missed. Preparations for this year’s show are going well. The main ring attractions have been booked and this year the Society is pleased to be welcoming Jason Smyth’s Adrenalin Tour. Jason and his team of top UK riders will be delighting the crowd with their amazing quad bike stunts including flying over 30ft high and jumping 75ft from ramp to ramp, whilst performing breath taking aerial tricks. The successful Discover Farming marquee that attracted fantastic crowds of youngsters last year will be even bigger and better; there will once again be a variety of ‘Farm to Food’ activities and interactive demonstrations for children to get involved with and to learn about food production and farming. This year there will also be a dedicated marquee called ‘Farmers for the Future’ where older children/young adults can experience first-hand a selection of new technologies that are being used in farming today such as robotic milking and the use of drones for inspecting crops. 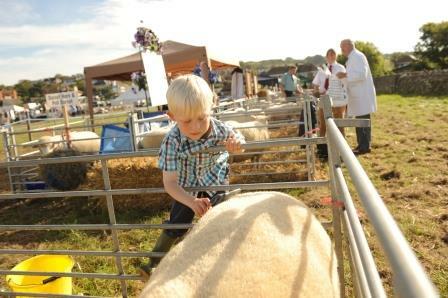 There is so much for children to see and get involved with including cookery, crafts and gardening competitions, as well as the special young handler classes in the livestock competitions –all are free to enter. Competition schedules will be available to view on our website from early May. Around the showground, as well as the Discover Farming and Farmers for the Future Marquees, there are so many animals for children to meet including alpacas, cattle, dogs, donkeys, ferrets, goats, horses, pigs, ponies, poultry, otters and sheep; not to mention the birds of prey who will be showing off their hunting skills in the Countryside Arena and of course, the fun fair. When they’ve had enough of the exciting activities and need a rest, there is a wonderful variety of food-to-go for all the family to enjoy as well as the local food hall to visit which will be brimming with food from local producers and suppliers. With so much to see and do at the Show the only way to keep up to date with what is planned is to visit our website regularly or follow Melplash Show on Facebook and Twitter.